Get Petrol Pump Attendants jobs in Dubai or jobs in Dubai for Matric pass 2017. One of the leading company is looking fuel pump helper or attendant for the full time job. Suitable candidates at least qualified matriculation with 1 to 2 years of experience in the same field and as well as candidate not more than 35 years old. Once you shortlisted by the company then you will get 3000 AED salary per month + Overtime + Transport + Accommodation + Medical and Health Insurance. Duty work hours will be 9 hours in a day and 6 days a week. If you think that you can fulfill the mention above criteria then please send your complete CV at given below email address. Once you shortlisted by the company then you will be provided competitive salary and benefits by the company. 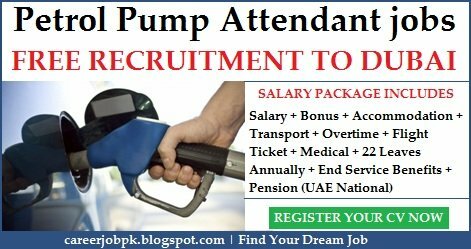 How To Apply For Petrol Pump Attendants Jobs in Dubai? To apply for the post of Petrol Pump Attendant Jobs then please visit the following link below. This position is no longer exists now. So please check back in a while.